I’m sure all of you have heard of the most popular tablet options on the market today, the giant brand names that cost upwards of $500. If you’re like me, that sum is a little hard to swallow. Well, you can take joy in knowing there are more affordable choices out there, with a few less bells and whistles, but with equal quality. The Pandigital SuperNova Tablet (Retail $227.99) is one of these less expensive options, which will satisfy all of your basic tablet needs. It is missing a few of the higher end features, but if you want a fully loaded machine you’ll have to spring for the higher price tag. You may know Pandigital from their line of high quality digital photo frames, like the one we gave an Editor’s Choice to a few years ago: http://computertimes.com/pantouchdigitalframe.htm. Being a trusted name for those products, it was easy to believe that Pandigitalwould deliver on its promises in this new line of devices. 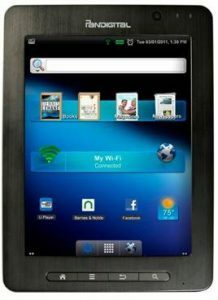 The SuperNova is their 3rd Android tablet model, and is well suited for surfing, gaming, eReading and more. The SuperNova has an 8” capacitive touch LCD screen, with a 600×800 pixel resolution, virtual keyboard, and orientation sensor. The resolution isn’t super high, but unless you are trying to stream HD video, it’s plenty for what you’ll be doing with a tablet. The capacitive touch screen allows you to zoom in and out using two fingers, which is a great feature that is not on some of Pandigital’s mid-range tablet competitors, and the orientation sensor allows you to view your screen in portrait or landscape automatically when you rotate the device. The virtual keyboard pops up when you need it and hides itself away when you don’t. Weighing in at just over a pound, with a nice matte surface finish, it’s comfortable to hold for extended periods. You get 2 cameras, front and back, to take photos and videos that can be uploaded and shared. You can hook the device to your TV though the HDMI port, though you will be tethered by the length of the connection cable. You can also connect other devices to the tablet through Bluetooth, and of course you’ll be able to easily connect to the Internet through WiFi whenever a signal is within range. The interface is easy to use, with intuitive menu screens, the ability to scroll through your desktop pages with the flick of a finger, and to add, remove, and organize shortcuts on your desktop with a couple touches. It comes built with a slightly modified version of the Android 2.3 operating system, a 1.06GHz Samsung Cortex processor, and 512 MB RAM. There are 4GB of on-board shared storage, but you can bump this up with a microSD card of up to 32GB of extra storage. The Barnes & Noble eStore comes pre-loaded so you can take advantage of the tablet’s great eReading capabilities right out of the box. Facebook, a browser, a YouTube video player, and many other convenient apps come pre-loaded as well. Unless you do some minor hacking, you won’t be able to access the Android Market from this device, but you can use the GetJar App Market that is loaded on the device, or download the Amazon App Store to get thousands of other Android compatible apps, many of them for free. The GetJar App Market, though not terribly comprehensive, still has a lot of pretty cool apps, and works as a quick-stop shop when you don’t want to go browse though the larger app supermarket. One of the great features on the SuperNova that isn’t on every tablet is the Flash compatibility, which allows you to enjoy all your favorite sites that require it to run, like some of the most popular gaming sites. The tablets that don’t have this are severely handicapped in my opinion. I can’t say too much about the specifics, but I have been told that there will be some impressive updates to many of the features in the next tablet model, to be announced later this year. These improvements will take care of the few minor issues I have with this device, and promise to round out an already quality product. In the meantime, you can keep your SuperNova up to date by downloading Firmware updates whenever the device prompts you to do so. As I mentioned, if you expect all the features of a $500 tablet, you should look at a $500 tablet, but if you want a more affordable solution that still delivers on all the key points, then you’ll be delighted with the SuperNova. It has great quality for the money, and stays competitive with its competition by offering several features that other comparably priced products do not. Find out more athttp://www.pandigital.net.